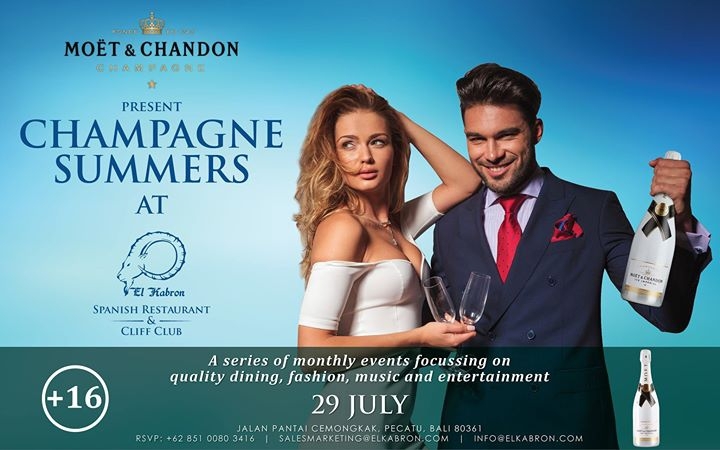 El Kabron would like to take this opportunity to invite you to join them on Saturday July 29th for the first in their monthly series of Champagne Summers events. This series of events will showcase some of the islands finest fashion designers, live musicians, DJs, performers and of course the highest standard of cuisine, champagne, cocktails and wine that many of you have learnt to expect from us here at El Kabron. For this particular event we are pleased to announce that your evening's entertainment will include performances from Eva Scolaro, catwalk shows featuring bikinis from Nico Nico, jewelery from Harold Alexander not to mention dance performances, fireworks and of course our annual tradition of Champagne Showers with the beautiful El Kabron models followed by an incredible dinner created by our executive chef, Marc Torices. Keep checking back for more information and updates regarding this event. Cliff Club - Pool and Balcony (From 16.00): IDR 650K, inclusive of a welcome glass of Moët & Chandon Champagne, IDR 300k credit on food & beverage and access to all areas. From 4-7pm the Tapas menu will be on offer in the dining area. After 7pm the only option for diners will be our Set Menu for 495k ++ per person prepared by our executive chef Marc Torices.